Morocco occupies the northwestern corner of Africa, across the Strait of Gibralter from Spain. During most of the nineteenth century, France, Spain, and other European countries maneuvered to gain control of the country. In 1912 it was finally divided; France assumed a protectorate over most of the country but Spain controlled the northern coast and portions of the south. In 1923 Tanger (Tangier) was removed from the Spanish sector to become an international zone. Morocco resumed its independence in 1956, but Spain continues to control the northern cities of Ceuta and Melilla and several small islands off the northern coast. For lighthouse fans, the implication of this history is that Morocco's lighthouse heritage is partly Spanish and partly French. The French zone of influence extends from Mehdia to Agadir, with Spanish influence to the north and south. However, the design of lighthouses in all parts of the country shows a strong native Moroccan style. 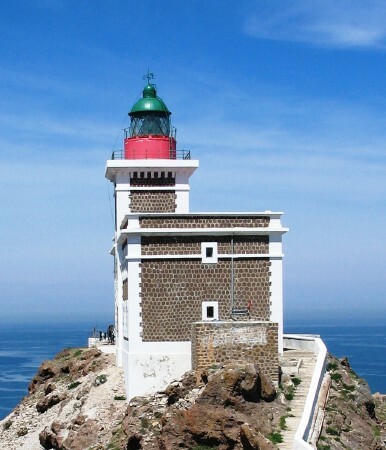 This page includes lighthouses of Morocco's north coast, facing the Mediterranean Sea. There is a separate page for the Atlantic Coast, and there is also a separate page for the Spanish Coast of Morocco, including Ceuta and Melilla. 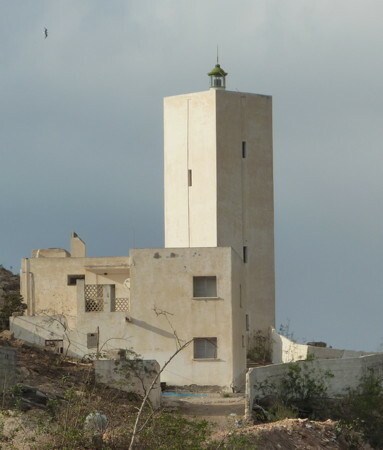 The Arabic word for a lighthouse is mnarh or manara (منارة). 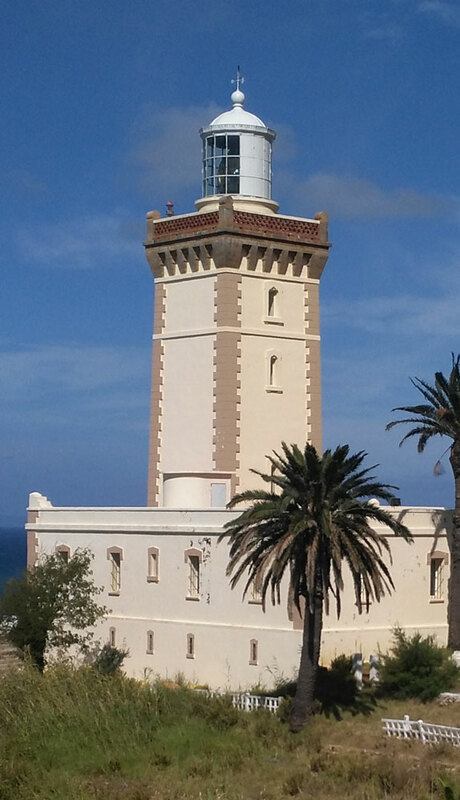 Lighthouses in Morocco are operated by the Ministère de l'Équipement and du Transport (MTP). ARLHS numbers are from the ARLHS World List of Lights. Admiralty numbers are from volumes D and E of the Admiralty List of Lights & Fog Signals. U.S. NGA List numbers are from Publication 113. Photos by various photographers posted by Alain Guyomard and Robert Carceller. Navigationalal chart information for northern Morocco. 1864. Active; focal plane 95 m (312 ft); four white flashes every 20 s. 24 m (79 ft) square masonry tower with castellated gallery, lantern, and 1st order Fresnel lens, attached to a 2-story keeper's house. Tower painted buff, the gallery is reddish, and the lantern is unpainted gray metal; the keeper's house is painted white. Fog horn (four blasts every 90 s). Saaleha Bamjee's photo is at right, Lightphotos.net has a photo, a 2009 view of the station is available, Guyomard and Carceller have a photo by Jean-Pierre Avenier, Wikimedia has a photo by M. Rais, Trabas has a view from the sea by Capt. Theo Hinrichs, Huelse has a historic postcard view, and Google has a satellite view. One of Africa's (and the world's) greatest lighthouses, this light marks the southeastern entrance to the Strait of Gibralter from the Atlantic as well as the northwestern corner of Africa. In international law the longitude of the Cape Spartel lighthouse (5°55'W) is recognized as the western boundary of the Mediterranean Sea. The lighthouse was built by Sultan Mohammed III and maintained during the colonial period by a consortium of western powers. 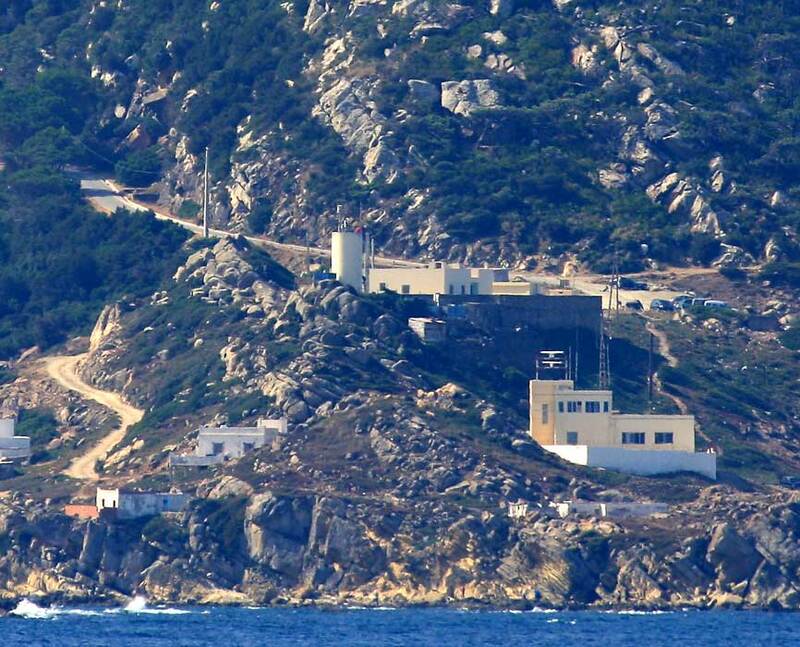 Now one of Morocco's best-known tourist attractions, the light station is on the cape about 20 km (13 mi) west of Tanger. Site open, tower open by arrangement with the keepers. ARLHS MOR-003; Admiralty D2510; NGA 22896. 2007 (?) . Active; focal plane 21 m (69 ft); three white flashes every 12 s. 16 m (52 ft) square skeletal tower. No photo available and Google has only an indistinct satellite view. The skeletal tower replaced a concrete tower seen in a November 2006 photo. Located at the end of the Tanger breakwater. Site status unknown. ARLHS MOR-049; Admiralty D2502; NGA 22888. Date unknown. Active; focal plane 88 m (289 ft); white, red, or green light, depending on direction, occulting three times every 12 s. 7 m (23 ft) "metal cupola on brown building," according to NGA. No photo available but Google has a satellite view. Located on the east side of the city of Tanger (Tangier). Site status unknown. ARLHS MOR-024; Admiralty D2500; NGA 22880. Date unknown. Active; focal plane 76 m (249 ft); white flash every 5 s. 18 m (59 ft) square cylindrical tower with lantern and gallery, rising from a 2-story keeper's house. Building painted white; lantern roof is weathered gray. Guyomard and Carceller have a good photo by Jean Besnard, Trabas has a view from the sea by Capt. Peter Mosselberger, Omar Fahd has a closeup street view, Youssef Moutawalli has a more distant street view, and Google has a satellite view. Located on a headland about 10 km (6 mi) northeast of Tanger, at the eastern entrance to the Baie de Tanger from the Strait of Gibraltar. Site open, tower closed. ARLHS MOR-032; Admiralty D2498; NGA 22872. Date unknown. Active; focal plane about 20 m (66 ft); three white flashes every 10 s. Approx. 15 m (49 ft) square skeletal tower. Trabas has Rainer Arndt's photo, but the tower is hard to spot in Google's satellite view. The original light had a focal plane of 11 m (36 ft). Located on a rocky islet off Ras Ciress (Punta Cires). Accessible only by boat. Site open, tower closed. Admiralty D2495. Date unknown. Active; focal plane 44 m (144 ft); white light occulting three times every 12 s. 8 m (26 ft) round cylindrical white concrete tower. No lantern; the light is displayed from a short mast. Trabas has a photo taken from the sea by Capt. Theo Hinrichs, Anass Loulidi has a distant street view from the nearby Dalya Beach, and Google has a satellite view. Punta Cires is at the narrowest point of the Strait of Gibraltar, and swimmers trying to swim the strait aim for this point from Tarifa, Spain. Located near Dalia about 50 km (30 mi) northeast of Tanger. Site status unknown. ARLHS MOR-051; Admiralty D2493; NGA 22864. Date unknown. Active (privately maintained? ); focal plane 11 m (36 ft); green light, 2 s on, 2 s off. Approx. 7 m (23 ft) round strongly conical stone tower; the upper 3/4 of the tower is painted green. Adnan Al Deibani has a distant view across the harbor and Google has an indistinct satellite view. Located at the end of the breakwater at Marina Smir, a resort harbor about 16 km (10 mi) south of Ceuta. Accessible by walking the pier. Site open, tower closed. Admiralty E6830; NGA 22838. Date unknown. Active; focal plane 135 m (443 ft); white light occulting once every 4 s. 13 m (43 ft) octagonal cylindrical tower with gallery and a small lantern. Upper 2/3 of the tower is gray, lower 1/3 white. Younes Rahali has a fuzzy street view and Google has a satellite view. This lighthouse is in an area developed intensively for tourism. 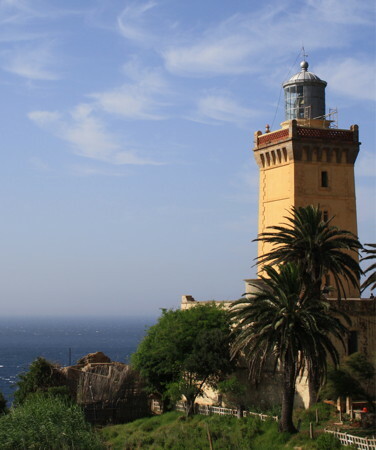 The lighthouse is listed as an attraction and is known for commanding a spectacular view of the Mediterranean Sea and the Rif Mountains, but photos are very difficult to find. Located on a cape near Mdiq, about 8 km (5 mi) north of Martíl. Site open, tower closed. ARLHS MOR-017; Admiralty E6824; NGA 22832. Date unknown. Active; focal plane 150 m (492 ft); white light occulting twice every 6 s. Described by NGA only as a "white round tower." No photo available but Google has an indistinct satellite view. Located atop a sharp promontory about 4 km (2.5 mi) north of Oued Laou. Site status unknown. ARLHS MOR-026; Admiralty E6789.5; NGA 22822. Date unknown. Active; focal plane 38 m (125 ft); two white flashes every 10 s. 4 m (13 ft) light mounted on or in a 1-story square equipment room. Building painted white; the small lantern is black. Mohamed Ali Assidah has a street view. The station is at the far right of Oussama Zibate's very distant view and Google has a satellite view. Located on a bluff at El Jebha, about 100 km (60 mi) west of Al Hoceïma and a similar distance southeast of Martíl. Site status unknown. ARLHS MOR-023; Admiralty E6789; NGA 22820. Date unknown. Active; focal plane 151 m (495 ft); two white flashes every 10 s. 16 m (52 ft) square tower with lantern and gallery; the lower portion of the tower is pyramidal and the upper portion is cylindrical. Lighthouse is white; lantern painted black. Miguel Ruiz has the photo at right, and Bing has a satellite view. 200 m (1/8 mi) southwest is a tall control tower with communications gear and a radar antenna. Located on a cape at the western entrance to the Bay of Al Hoceïma. Accessible by road. Site open, tower closed. ARLHS MOR-008; Admiralty E6786; NGA 22788. Date unknown. Active (? ); focal plane 14 m (46 ft); green light, 2 s on, 2 s off. 7 m (23 ft) round strongly conical white concrete tower on a square base. Mohammed al Arabi has a distant view, and Google has a satellite view of the breakwater. Located at the original end of the east breakwater at Al Hoceïma. The breakwater has been extended, and the light has probably been moved to a post at the end of the extension. Probably accessible by walking the breakwater. Site open, tower closed. Admiralty E6785.2; NGA 22808. Date unknown. Active; focal plane 62 m (203 ft); three white flashes every 12 s. 32 m (105 ft) octagonal 3-stage concrete tower with castellated gallery and a small lantern, attached to the seaward side of a 2-story concrete keeper's house. The building is unpainted gray concrete. Miguel Ruiz contributed the 2004 photo at right, Elarbi Amakri has a 2017 closeup photo, Daniel Brieba has another photo, and Bing has an excellent satellite view. Located on the cape about 40 km (25 mi) east of Al Hoceïma. Site open, tower closed. ARLHS MOR-004; Admiralty E6784; NGA 22784. Date unknown. Active; focal plane 49 m (161 ft); white light occulting three times, in a 2+1 pattern, every 12 s. 4 m (13 ft) round cylindrical concrete tower with a small lantern. Lighthouse is unpainted; lantern is green. No photo available but Google has a satellite view. Located on a bluff on the west side of the Trois Fourches peninsula about 15 km (9 mi) northwest of Melilla. Site open, tower closed. ARLHS MOR-013; Admiralty E6780; NGA 22776. 1909. Active; focal plane 112 m (367 ft); four white flashes, in a 3+1 pattern, every 20 s. 18 m (59 ft) square cylindrical stone tower with lantern and gallery, rising from a 2-story stone keeper's house. A 1st order Fresnel lens is mounted in the lantern, although the light may have been moved to a post at the seaward end of the building. The house is dark stone with white trim; lantern painted red with a green dome. A photo is at the top of this page, Hamid Kaouass has a closeup photo, Abdelbari Talbi has a street view, and Google has a satellite view. In all languages this is the Cape of Three Forks. It lies at the end of a rocky peninsula projecting about 30 km (19 mi) into the Mediterranean, making this one of the most critically important lights on the Moroccan coast. Located on the cape, about 20 km (13 mi) north of Melilla. Accessible by road, although 4WD may be needed. Site open, tower closed. ARLHS MOR-002; Admiralty E6778; NGA 22772. 1928. Active; focal plane 21 m (69 ft); white light occulting once every 4 s. 5 m (16 ft) round cylindrical masonry tower; lantern removed. 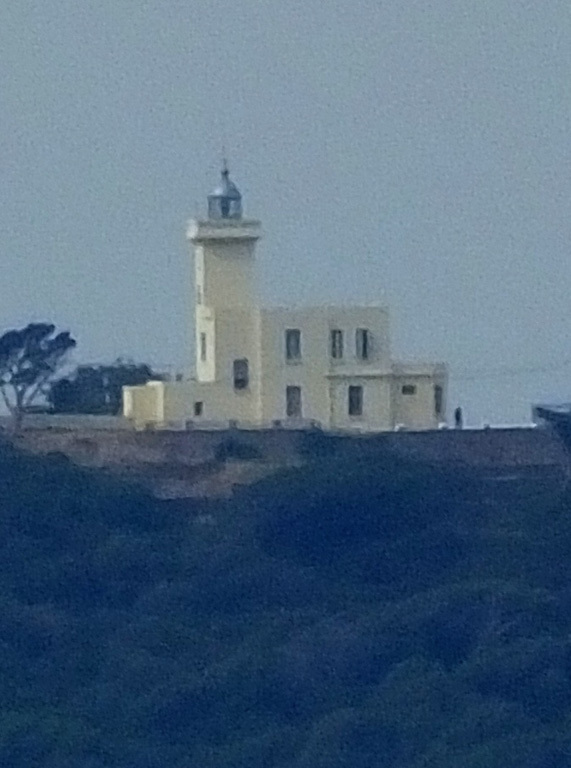 Lighthouse painted with gray and white horizontal bands. Juan Pascual has a view from the sea, and Google has a satellite view. Located atop a small rocky island off the east side of Ra's Tleda Madari (Cap des Trois Fourches), about 15 km (9 mi) north of Melilla. Accessible only by boat. Site and tower closed. ARLHS MOR-025; Admiralty E6776; NGA 22768. Date unknown. Active; focal plane 42 m (138 ft); two white flashes every 6 s. 8 m (26 ft) light tower centered on an octagonal stone keeper's house. Next to the historic lighthouse is a square cylindrical concrete tower about 25 m (82 ft) tall carrying a large round control room. The top of the taller tower has communications gear and a radar antennas. Lahouari Boulayoun has a distant street view and Google has a good satellite view. Located on the cape near Ra's Kebdana, just northwest of the harbor. Site status unknown. ARLHS MOR-018; Admiralty E6757; NGA 22720. Date unknown. Active; focal plane 12 m (39 ft); green light, 3 s on, 3 s off. 7 m (23 ft) square cylindrical concrete tower, painted white. This light is on the left in a Lightphotos.net photo of the two lights, Lahouari Boulayoun has a street view along the pier, and Google has a satellite view. Ra's Kebdana is a modern fishing port at the tip of the Ra's el Ma peninsula. Located at the end of the north breakwater. Accessible by walking the pier. Site open, tower closed. ARLHS MOR-035; Admiralty E6757.2; NGA 22721. Date unknown. Active; focal plane 13 m (43 ft); red light, 3 s on, 3 s off. 7 m (23 ft) square cylindrical concrete tower, painted white. This light is on the right in a Lightphotos.net photo of the two lights, Lahouari Boulayoun has a street view across the harbor, and Google has a satellite view. Located at the end of the east breakwater. Accessible by walking the pier. Site open, tower closed. ARLHS MOR-034; Admiralty E6757.25; NGA 22722. Tanger (1883-?). 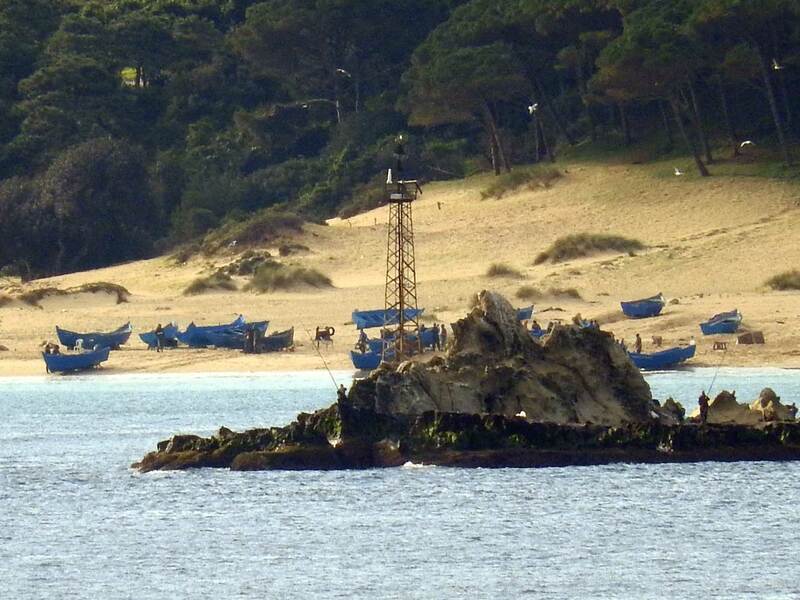 This lighthouse has been demolished. ARLHS MOR-047. Posted August 18, 2005. Checked and revised April 18, 2019. Lighthouses: 19. Site copyright 2019 Russ Rowlett and the University of North Carolina at Chapel Hill.